It could have been because I had been stuck in grey-stricken Chicago for most of the winter or because I was finally getting the first opportunity to see the architecture and design skills of the man who made me fall in love with the game of golf, but I can’t remember a round of golf that I was more excited for than Bluejack National. One of my best friend’s weddings took me to Houston, a friend who I have played nearly 100 rounds of golf with, and his wedding gift came early when I told him we could play Bluejack National. Before Bluejack National, there was Blaketree National Golf Club, the dream of illustrious oil man Thomas Blake, who set out to build his dream course. Blake contracted Bill Coore and Ben Crenshaw to do the job, but halfway through decided he knew better, taking over the project and building the rest himself. This would be the first setback in the (at one time promising) course’s tale. Blaketree National opened in 2000 and became one of Houston’s best courses, but then the untimely death of Thomas Blake sent the course into a downward spiral, and ownership was taken over by his family, who eventually sold it to a new ownership group that quickly shuttered the project and closed the highly acclaimed course in 2005. Rave reviews of the property were a common theme from people who played Blaketree. With its towering oaks and rolling hills, it was a setting that looked more like the sandy hills of the Carolinas than flat, flood-infested Houston, Texas. Beacon Land Development saw the potential for the site and pounced on the deal, purchasing the 755-acre site in 2014. With the purchase, the Bluejack dream was born, guided by Beacon founders Michael Abbott and Casey Paulson’s philosophy of delivering the best luxury experience in golf. The vision for Bluejack was set, a premier private club and community rooted in making a great experience for the whole family. Beacon made a big splash by hiring Tiger Woods and Beau Welling Design to build a brand new golf course on the site, making Bluejack the first Tiger Woods-designed golf course in the United States. Woods and Welling broke ground in early 2015, and the course opened in 2016 to rave reviews, winning a handful of accolades like “Best New Private Course” from both Sports Illustrated/Golf Magazine and Golf Digest. Reflecting back on the day at Bluejack, the golf course exuded some of my favorite aspects of design. Playability: Tiger and his team were able to achieve the difficult feat of making a course very playable yet thought-provoking and interesting for the expert player. The way that he used mounding around the greens to allow for alternative routes to small targets was a genius way to keep the regular golfer in the game. I thought the width and wall-to-wall fairways were great, and our group (which had a scratch player, a five, and a ten handicap) didn’t have to look for any golf ball… the least enjoyable aspect of golf. Variety & Naturalness: Bluejack had par 3s, all of varying lengths, and its par 4s and par 5s had great balance. This variety was matched on the course, where no two holes played similarly to the other and each was distinctly memorable. Woods did this while never creating a hole that seemed out of place or manufactured on the terrain. 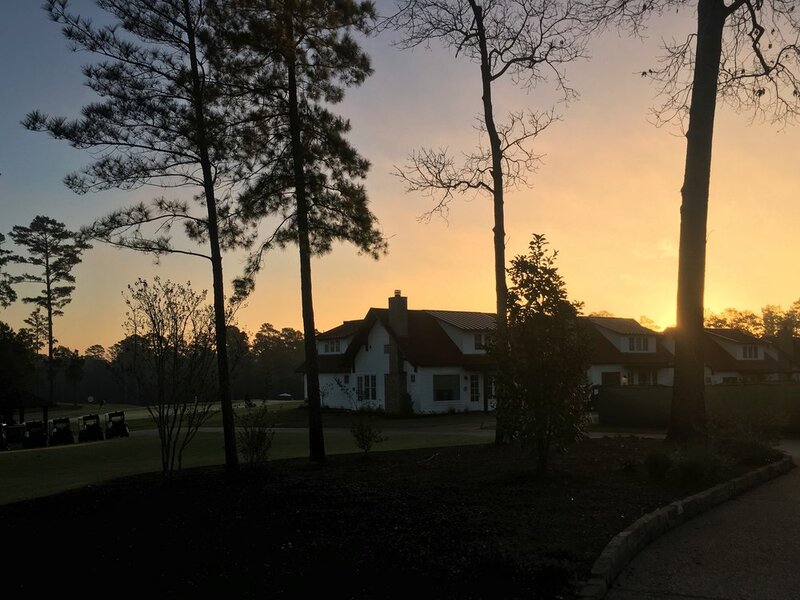 Fun: The endless options on and around the greens, the drivable par 4s and reachable par 5s, the wide fairways and the off-the-course amenities make Bluejack a place where you want to spend a lot of time. It’s pure fun. It makes sense that Tiger would be a great architect. As a player, he was the ultimate tactician. He knew exactly how he wanted to pick apart a golf course, and where he wanted to miss. At Bluejack, every corner I wanted to cut, and every spot I looked to bail, I found trouble. And while I found challenges, they were seemingly unobstructive to the everyday player. I eagerly await the next opportunity to see another Tiger Woods design and am bullish on him becoming one of golf’s great architects. As for Bluejack, I have a feeling it's a course that gets better with every trip around it. On a buddy’s advice, we left for Bluejack early to take in the vibe, hitting the road at 6am to make the hour drive from downtown Houston to a small town called Montgomery. The land began to transform as we neared the course. Houston’s flat, nondescript topography was replaced by pines and hills, a promising sign for any golfer. We got to Bluejack National’s unforgettable gate just as the sun was coming up, and the friendly Bluejack staff was setting up the course. From the moment you arrive, a relaxed and luxurious vibe is cast over you. Unlike many golf developments, there are very few rules at Bluejack; the common theme of the property is fun. “Fun” is embodied all over the property among the lighted short course, the 120-yard putting green, the driving range with music and a large target, the family-centric Fort (which is under construction), and most importantly, the golf course. After chowing down a few breakfast tacos, a blanket of fog had strangely descended on the property as we headed out to the range to warm up and get ready to tee off. As we walked to the first tee, the fog lifted and we were treated to clear blue skies, a slight breeze and 80 degree weather, perfect for golf. We opted to play the 6,959-yard back tees (not the Tiger Tees that stretch to 7,500+), which feature wall-to-wall Zoysia fairways and Bermuda green complexes. Bluejack has a couple first tee traditions, the first a modified game of poison to determine the teeing order, and the second one akin to Riviera, where each player's name and hometown are announced before they hit their first tee shot. The first hole gives players a feel for a few common themes ahead, width, well-positioned bunkers, and thought-provoking green complexes that allow for a vast array of approach shots and recovery options. Off the tee, the ideal shot is a right-to-left shot that works off of the large and deep bunker that sits at about 280 yards from the tee box. The bunker’s placement is perfect, only in reach of the long and likely expert player, a perfect line for a shorter and higher handicapper. The hole plays slightly downhill, and a good drive will get considerable roll. The long and interesting green complex clearly rewards those who take a more aggressive line down the left side near the water with a shorter and better angle to approach the green, which slopes right to left and has a spine that divides the front and back halves of the green. The pin was in the front part of the green, and the pronounced shoulder on the right lets players funnel the ball from the right side without taking on the bunker. Those that want to take on the flag better not miss left. Players learn quickly that the short side is not a good place to be at Bluejack. Tiger clearly wanted to emphasize the ground game and imagination at Bluejack. To promote using the flatstick and bump-and-run shots, they keep the fairway surrounding the green complexes mown extremely short. The view from the right bunker, playing safe makes for a longer approach shot. The undulating front half of the first green. At first glance, Bluejack’s aesthetic appearance often gets compared to Augusta because of the towering pines, wide fairways and white sand bunkers with sharp edges. The second hole surely fits the bill as it looks and feels like it belongs at Augusta National. Bluejack’s first par five plays slightly downhill off the tee and doglegs sharply to the left. Woods wisely placed a large and treacherous fairway bunker right on the desired line. This bunker, which requires a 280+ yard carry, forces players to make a decision, go for the heroic line up the left side, or play it safe and hit it down the right side, leaving a significantly longer second shot in. I played a little fade off the bunker and was rewarded by catching the right side of the slope, leaving me a mere 225 into the green. For those who have to layup, the second shot becomes about angles to the green, which is shaped similar to a three leaf clover and has extremely deep bunkers protecting its right and left sides. A shot to the wrong section of the green makes for a nearly impossible two-putt, something I found out firsthand when my second shot found the front of the green, and I walked off the green with just a par. The deep fairway bunker which dictates the tee shot. Looking back at Bluejack's par 5 2nd. After the scorable first and second holes, Bluejack notches up the difficulty with the beautiful uphill par-3 third. The third’s defining characteristic is the expansive green with a lot of back-to-front slope. A prudent play is to stay below this hole location. Left of the long par 3. Looking back at the 3rd green. The fourth is seamlessly placed over the back part of the third green. Tiger uses a little bit of deception with the pine trees on the fourth. There is plenty of room to the right, but a player can easily be blocked out by the large pines that guard the right side. While the right side presents the shortest approach and best angle to approach the green, it also carries the risk of being partially blocked out. The fourth played slightly uphill and into a freshening wind, leaving mid-iron approaches into the green (a green that perches naturally on a ridge that slopes from right to left). Any shot left of the green leaves a brutal short-sided uphill pitch. What I love about the fourth’s green is the exterior contouring that funnels a running shot towards the green, a shot that a low handicapper would likely never consider, but one that allows a lower ball hitter a safe path to the green. Approaching the 4th green from the left side. Looking back from the behind Bluejack's 4th. The tough fourth is followed by the expansively wide par-5 fifth, which moves slightly to the right and favors a left-to-right tee shot. The aggressive line is to take the tee shot over the right fairway bunker, which is about a 260-yard carry and will set up a chance of getting home in two. Woods uses a trick of deception with the large bunker on the left side of the green. To the eye, it appears to be pushed up on the green, but there is actually about 25 yards between its lip and the front of the green, making the ideal attempt to go for the green in two right over it. The green complex is long and narrow, with the back half of the green running away from the player and a drastic fall-off on the right side. A shot slightly left will funnel into the green, while a shot slightly right will meet impending doom. The tee shot at the par 5 5th. The approach to Bluejack's par 5 5th. A closer look at the approach shot. Left of Bluejack's 5th green. Before the 6th, players are treated to one of Bluejack’s signature comfort station breaks. This one is dubbed “The Fruit Stand” because players are treated to an expansive selection of fresh fruits and mostly healthy snacks for fuel. I tried out the mango slices on a recommendation from a friend and highly recommend! One of my favorite holes on the property was the mid-length, par-4 sixth, which plays uphill and possesses some of the most interesting bunkers on the course. Like many holes, the fairway is made significantly more narrow at about 280 yards from the tee by a bunker, right where a longer player hits it. The reward for going up the right side is a shorter approach, but the better angle and view to attack the green is up the left side of the fairway. The second shot to the sixth is made intimidating by deep greenside bunkering that fronts the green’s right side. The left half of the green will funnel a shot towards the middle but miss a little too far left, and your shot will tumble down a slope and leave a blind pitch up to the green. The best place to miss is long and right, which will leave a simple pitch back to the green that slopes hard from left to right. The left side opens up the angle to the green. One of the deep greenside bunkers at the 6th. Continuing the tremendous variety in holes, Woods follows the medium length par 4 with the short and vexing par-3 seventh. The seventh plays over the lake it shares with the first hole and offers a stunning view of the beautiful pine backdrop. The green demands precision since it has two distinct tiers and is very shallow. A shot too short will find the water, and a shot slightly long will be pitching back to the small green. Everyone loves a great short par 4, and Woods gives us two great ones at Bluejack. The first is the quasi volcano green 8th. The hole begs you to go for the green, and the tall pines obstruct the ideal left-to-right ball flight that the hole calls for. The green is long and narrow, and a perfect drive is rewarded with a great eagle chance. However, anything just short or right of the green will funnel into a collection area that is some 40’ below the green. Any shot too far left will find a small swale that leaves a treacherous chip shot with a deep collection area to the right looming. The eighth is one of those great short par 4’s where scores of 2 and 8 are easily attainable. The drivable par 4 8th at Bluejack. The front of the drivable par 4 8th shows the heavy left to right slope. Closing out the front nine is the long, uphill par-4 9th. Bunkers cut in on the right side and narrow the fairway for the longer hitters. The second shot is obstructed by a deep greenside bunker that guards the right side of the narrow green. The green complex is sloped heavily from back to front and has a severe fall-off on the left side. Something I noticed on this hole (and thinking back was a common theme) was the use of the sloping fairways to enhance the challenge. I hit a great drive up the left side and had about 150 yards to the green. The fairway sloped from right to left, giving me a hook lie to a green that you don’t want to miss left on, I overcompensated and short-sided myself in the front right bunker (not fun). This subtle little design trick is pure genius. The uphill approach to the par 4 9th. Right of the par 4 9th green. Looking back at the par 4 9th. If you didn’t think Bluejack had an Augusta look to it yet, the par-4 10th will convince you otherwise. The dogleg par 4’s tee shot was one of my favorites on the course. Tiger used a trio of cross bunkers down the left side to force a player to choose how much to bite off. The furthest bunker is about a 300-yard carry, with each successive bunker about 30 yards shorter. The reward for a bold play over the furthest left bunker is a mere flip wedge into the elevated green. I took it over the second bunker and was left with a wedge into the perched green, guarded by two front bunkers. The ledge the green sits on forces players to exercise distance and spin control with their shots. One with too much spin can easily find its way to the bottom of the hill. Meanwhile, there is plenty of room over the green for the shorter hitter who has to play a low-running shot into the green. Looking down the bunkers at the 10th. Right of the 10th green. Width. The 11th features a nearly 100-yard wide fairway that slopes significantly from right to left. The eleventh is everyone’s chance to let the big dog eat. A long drive can yield a chance to go for the downhill par 5’s long and narrow green in two. The green has a very steep fall-off on the left side, and any shot that is slightly too hot will find the right bunker, which leaves a tough sand shot to a green sloping away. A perfect attempt to go for it in two is rewarded with a chance at eagle or birdie, and any not quite up to snuff will have to scramble to make 5. The view from the 11th fairway. Looking back at the par 5 11th. Quite the contrast from the fruit stand is the BBQ stop, where Bluejack’s resident chef serves up juicy barbecue brisket and homemade jerky. The most photographed hole at Bluejack is the downhill par-3 12th, which bears a striking resemblance to the twelfth at Augusta National (sans the front bunker). The shot plays downhill about a club, and any flag right of middle tests a player’s nerve. The bailout option is left, leaving a lengthy putt, or if long, a dicey bunker shot staring back at the lake. The picturesque par 3 12th. Short left of the 12th green. Looking back at the par 3 12th. The thirteenth presents a great birdie opportunity to those who can find the fairway on the short par 5. The tee shot for a longer hitter is pinched by a bunker on the left and right sides, making the ideal shot shape a right-to-left shot that threads the needle. The deep fairway bunkers require layups for any player who finds them. I love how Tiger and his team used one of the more bold greens on the course on the short par 5, employing a sideways Biarritz green that stretches some 60 yards horizontally. This width to the green drastically alters the strategy for the hole depending on where the pin position is. The toughest pin is the back left flag and requires players to take on the bunkers on the left side. Any player who bails to the middle of the green will be left with a tough two putt up the ridge. The right side of the biarritz green at the 13th. Looking back at the par 5 13th and biarritz green. Off the tee on the short par 4, avoiding the deep fairway bunker is key. There is a lot of fairway to the left, but the angle from that side leaves a lot to be desired. The small kidney bean-shaped green has a deep bunker on the left that guards the middle and back parts of the green from a run-up shot. The vexing green’s front portion has a subtle false front that is difficult to see, and the right side falls off into a collection area, requiring a very precise wedge shot to earn a good look at a birdie. The second shot to the par 4 14th. Looking back at the par 4 14th. On the walk to the 15th tee, players get a look back at the tenth green and eleventh tee shot before they begin the final stretch. The mid-length par-3 fifteenth offers a small target that is guarded by a deep front left bunker. The wise play is to use the right bank to funnel the ball back to the hole and avoid taking on the flag. The green is another tough test as it slopes hard from right to left, making the ideal spot left of the flag, a tough spot to get to because of the bunker. Left of the 15th green. Looking back at the 15th and 10th greens. The long dogleg left par-4 16th starts the closing stretch of par 4’s. Woods placed the hole’s lone bunker on the left side to obstruct players from cutting the dogleg and shortening the hole. The bunker is a 265-yard carry and rewards brave players with a short approach to the bunker-less green. The second shot plays downhill to a green that was seemingly laid on the land’s natural contours. The 16th tee shot at Bluejack. The approach to the bunkerless 16th green. Right of the subtle 16th green. Looking back at the 16th. Sandwiched between two of Bluejack’s longer par 4’s is another great and short par 4, the 17th, which plays uphill to a small and well-protected green. The hole’s three bunkers on the left side protect the ideal angle to approach the green, and unless the hole is downwind and drivable, the wise play is to lay back short of the bunkers. If it is downwind, you have to let the driver rip and go for the green, but any shot right will leave a tricky chip. I found myself there with a middle-right pin, leaving a dicey 30-yard wedge shot over a bunker to a shallow green. The perfectly placed left bunkers. Looking back at the 17th green. Bluejack’s finale is the tough par-4 18th that plays back up the hill. The first challenge is to avoid the bunkers on both the right and left sides. Playing into the wind, we were lucky that our drives all came up short of the bunkers but left lengthy approach shots into the elevated green. The green has a large bank that runs along the back and right side of the green, allowing wise players to funnel shots into the green and avoid missing left (where there is nothing good). The 18th tee shot at Bluejack. The approach to the 18th green.